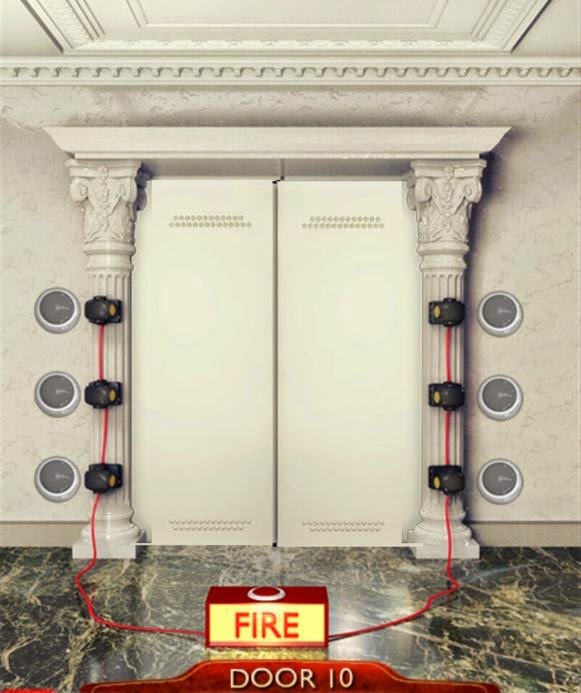 The first 10 levels of 100 Doors 2 are pretty easy. They are designed to give the new adventurer a taste of what will follow and to learn the interface. You should not have many difficulties cracking them! 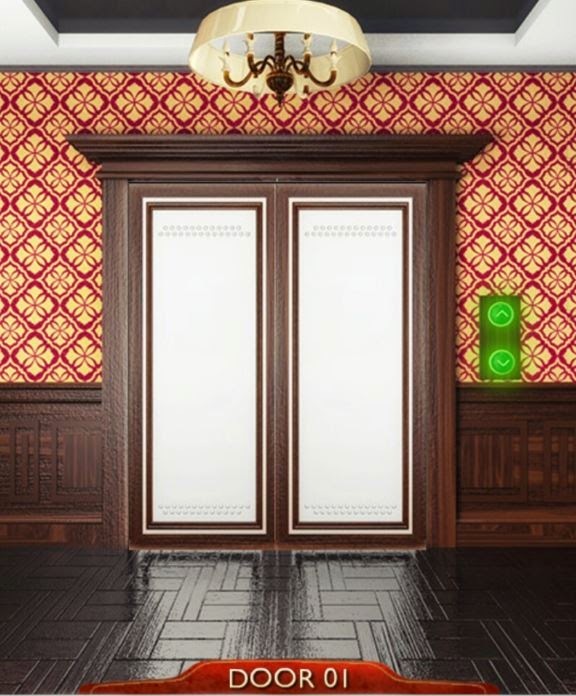 Press the green lift button to open the doors. 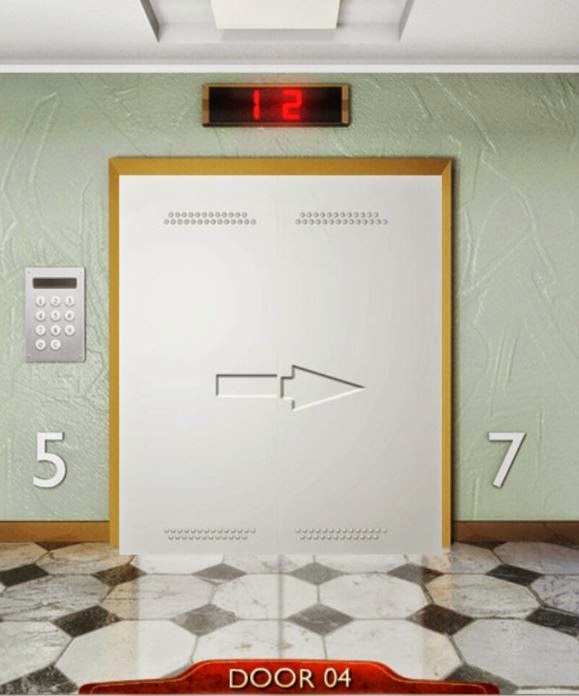 Enter the lift and level 1 will be solved. Press the green arrow to move on. Soltution: There is a silver ball at the bottom. Roll the ball left to the button to switch on the left light. Roll it to the other side to turn on the right light. 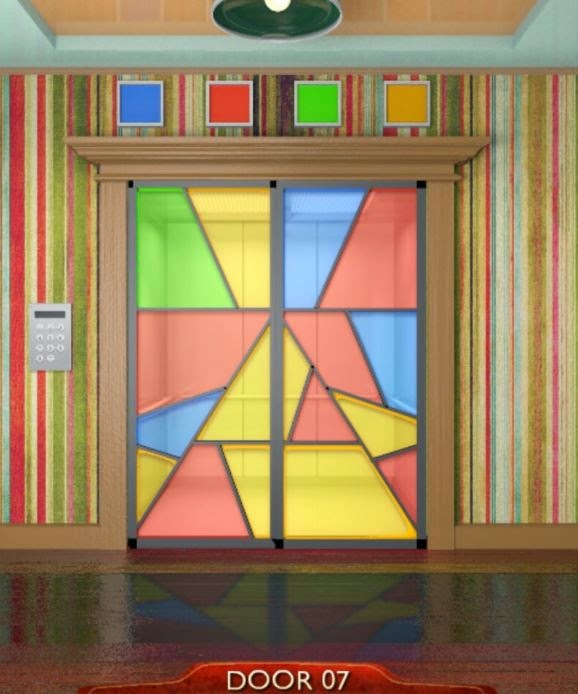 Lift doors will open and you can escape to the next level. - To roll the ball, you need to tilt your device so that it rolls "down". 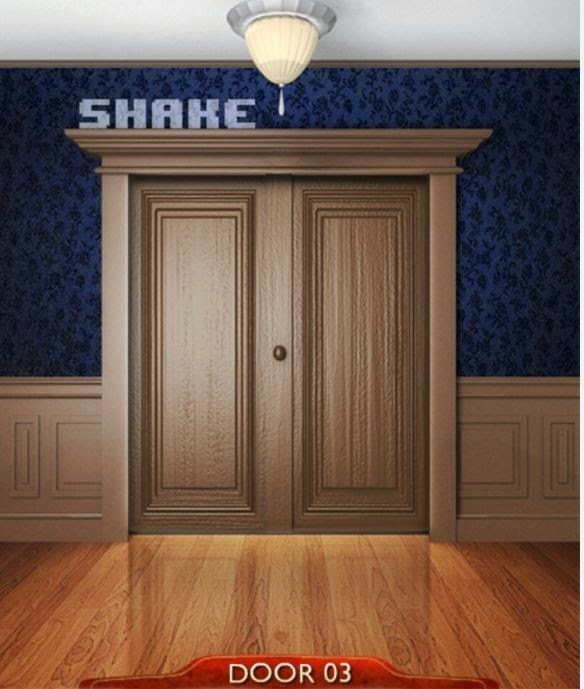 Read the Hint above the door "SHAKE". To solve level 3 you need to shake your device. Be careful that your device do not slip and fly and break! If you battle to shake this level correctly, start by holding the device upright then imagine you want to put it down flat on the table. Repeat this motion about 5 times and the doors will fall off. There is a 5 and 7 on the sides, and a 12 at the top. The arrow on the door shows the direction. Use the keypad next to the door and enter 5127 then hit the enter key (arrow) on the keypad. Pick up the lever. The lever will now be in your inventory. Use the lever on the lever-hole to the left of the door. 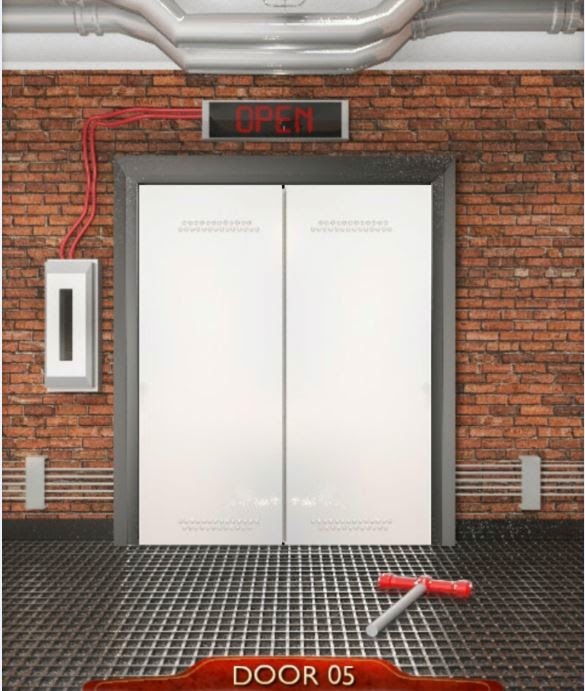 Push the lever up to open the door. Pick up the knife from the floor. Pick up the key from the broken crate. 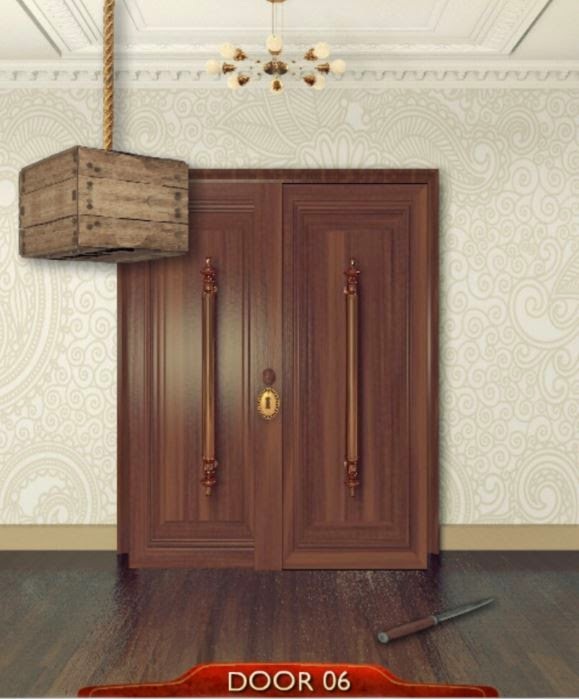 Unlock the door with the key to escape. Hint: Order above the door. Solution: Count the number of pieces of each color. The order is above the door. This number will be the password for level 7. Hint: The locks as per the picture above are all in the "open" position. 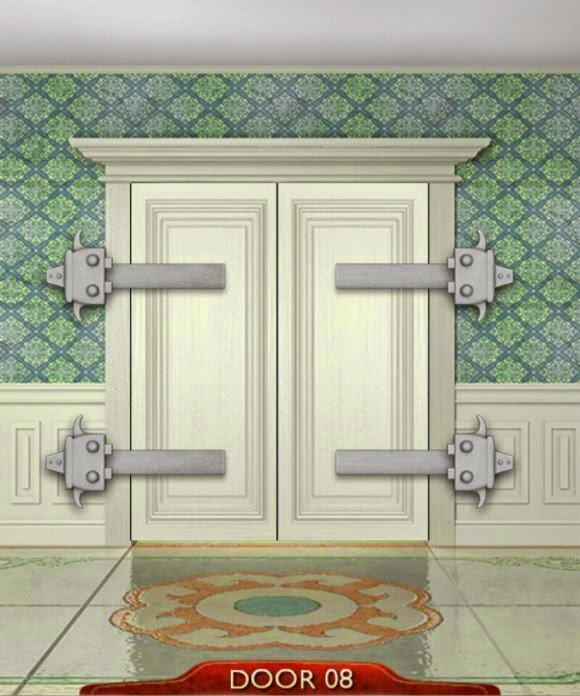 There are 4 locks on this door. 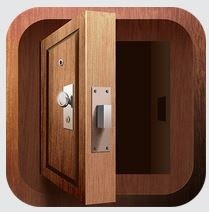 Unlock 2 on one of the sides, the tilt your device so that the iron bars slide out. When they are out, lock that side. Repeat with the other side. 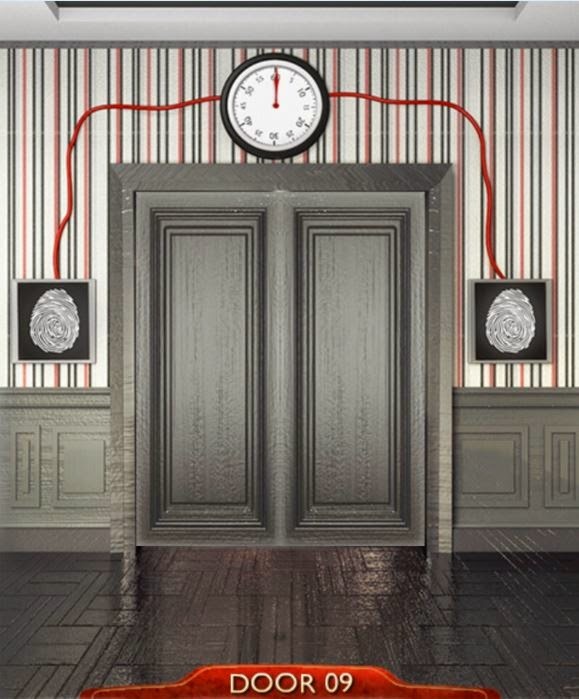 You will see 2 fingerprint readers in door 9. Press both readers simultaniously and hold down until the clock reach the 60second mark. 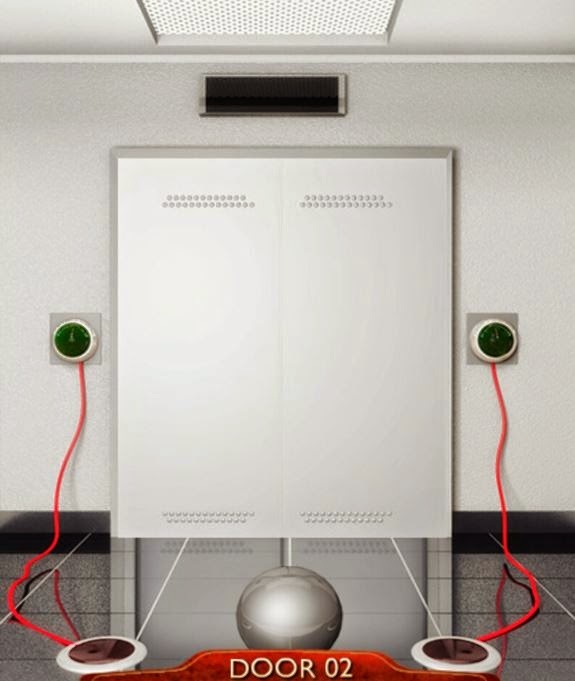 Press the fire button and remember the path that the red beam travel. Repeat this path to win. If you are correct the buttons will stay green. If you make a mistake they all go red. Well done on solving the first 10 levels of 100 Doors 2! I hope you enjoy my walkthrough. Great information thank you so much for posting these kind of security door information.